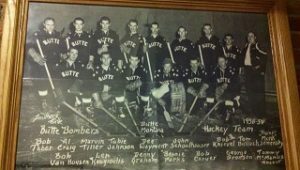 June 28, 2017 / NationalTeamsOfIceHockey / Comments Off on EVEL KNIEVEL and the BUTTE BOMBERS. Robert was a bit of a rebel, and after a police chase that he led on a motorcycle resulted in a crash and landed him in jail. He was in a cell next to a man known as `Awful Knofel` immediately Knievel got his nickname `Evil Knievel` from his name rhyming night jailer. After a few years he did not want to be known as `Evil` so he changed it to `Evel` a name that stuck for the rest of his life. Robert played for the Charlotte Checkers a minor-pro team in the Eastern Hockey League before he decided to start up his own team the `Butte Bombers` in 1959 and even convinced the Czech Olympic team to play a warm up game prior to the 1960 Olympics. As a player he was a real show-off and had to be the life of the party all of the time, former players rated him 7 out of 10 but would not trust him as far as they could throw him. Tubie Johnson another colleague said he was a good athlete but was always getting into scrapes and was the biggest bullshitter in the world. 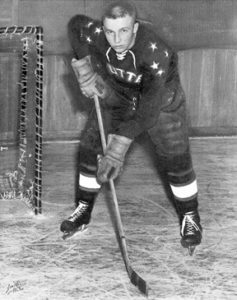 In September 1958 at nineteen years old Knievel became the most important figure in Butte hockey. He started his own semi-pro team the `Butte Bombers`. He was owner, coach and of course starting centre, quite a remarkable string of titles for a 19 year old. Start-up money came from his father and grandfather Ignatius and a car dealership. The local sports goods dealer Phil Judd provided Knievel with uniforms and equipment on credit, something he would probably regret later. Knievel offered players $50 per game, he put together an ambitious schedule which included semi-pro teams from the US and Canada, a few minor league juggernauts and some big name colleges from Minnesota and Michigan. Knievel was not a bad player but if he had passed the puck a bit more and not shot every time he got it, his play but have been a whole lot better. He always set himself up to be the star, putting himself on the ice for power plays, penalty killing and all the big moments as centre for the 1st line. Little self placed stories appeared in the local newspaper mentioning interest of him by other minor league teams but they all ended with how happy he was playing with the Bombers. Knievel was hard to pin down especially when money was involved, the players soon found out that that $50 per game was a mirage but they kept playing as it was the only team around. Without the help of Phil Judd for giving Knievel credit for sticks and equipment they would of faded into oblivion but they managed to scrape by. In 1960 Robert Knievel secured the biggest coup of all when he persuaded the Czech Olympic hockey team to play an exhibition game prior to the upcoming Olympics. The game was played at the Butte Civic Arena on Feb 7th 1960, two thousand fans packed the Civic Center. The game itself was a GOAL FEST the Czechs pulverized the Bombers 22-3, the game was a rout of routs, the Butte goalie saved 69 shots. Tubie Johnson said the Czechs were just messing with us they were being kind it could have been 105-0 if they wanted. Knievel came out during periods and pleaded for financial help from a microphone as assorted buckets were passed around the arena he mentioned that the Czech delegation was larger than he had expected and their expenses were much larger than he first had imagined. The money was collected but allegedly none of it ever reached the Czechs or creditors. One thing for sure was that this was the end of the road for the Butte Bombers and Evel Knievels hockey career. He was 21 years old retired from hockey, off to other interests and other projects. EVEL KNIEVEL” as we all knew him attempted more than 75 ramp-to-ramp motorcycle jumps and even attempting a canyon jump across Snake River Canyon(which failed) in a steam powered rocket called the Skycycle X-2. He still holds the Guinness Record for `Most broken bones in a lifetime` which is 37. He went through 15 major operations and spent nearly 3 years of his life in a hospital bed. Robert Knievel died of pulmonary disease in 2007 aged 69. This blog is just a snippet of his fascinating story.